What Treat Will Ruben Eat? Teaching young students about not sharing food after teaching them to share everything else can be difficult sometimes. Allergies are much more common and due to the severity of some food allergies schools must be diligent. 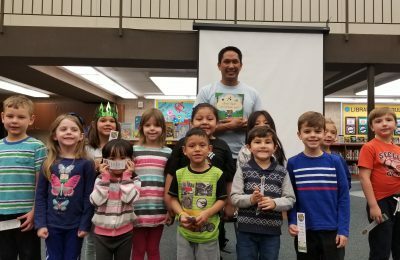 Author and Kennett Consolidated School District parent, Mr. John Aranton, Jr., has been a huge help to the staff at Mary D. Lang Kindergarten Center with his educational, entertaining story about a raccoon named Ruben. Each year, Mr. Aranton, shares his story through a children’s book he authored after dealing with allergies himself. 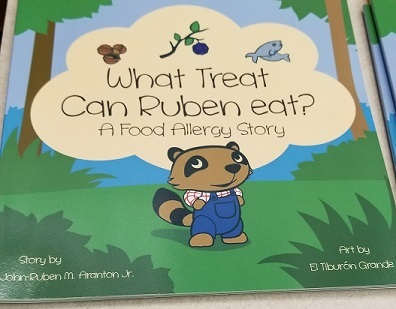 The book tells the story of a raccoon named Ruben who is embarrassed about his allergies but comes to find out his friends are more accepting than he had anticipated. 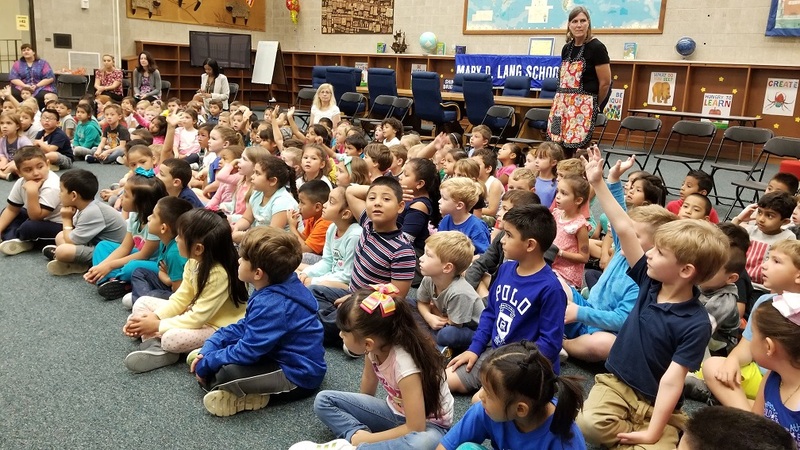 This year’s kindergarten students were a great audience and they proved it by answering questions about the story and about allergies themselves. Mr. Aranton hands out either a sticker of Ruben or a bookmark for questions answered correctly. The students were engaged and have a much better understanding of why we shouldn’t share food and to ask questions prior to spending time with friends outside of school. Written by John Aranton Jr.
Students stand with Mr. Aranton for a photo celebrating their correct answers during the presentation. Kindergarten Students Earn a Ride on the Polar Express! 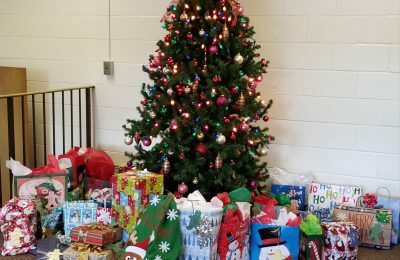 All month long, Nurse Kelly Hostetler and Mrs. Jane Henry collected, counted, and kept track of how many items were donated. The totals were announced on the intercom so that students could hear their progress. Nurse Kelly and Mrs. Henry are proud to announce that the students not only met their goal, but they more than doubled it! To date, the amount collected is 1,145. With a few more days to donate, we couldn’t prouder of our students as they make a difference in the lives of others. One of our school rules is “Take care of others.” Our students are truly living out the words they recite every morning. Nurse Kelly and Mrs. Henry display all of the donated items collected in November and December. 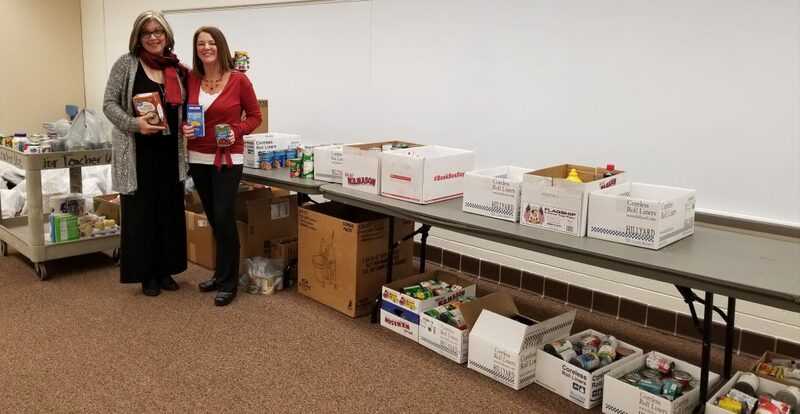 Mrs. Jane Henry, Mary D. Lang Kindergarten Center Administrative Assistant and Mrs. Kelly Hostettler, School Nurse, have teamed up to organize a food drive at the school. Families are asked to send in cans of food, boxed foods, dry goods, and paper products to help the Ronald McDonald Charities. Items can be sent in your child’s book bag until December 22, 2017. Thank you in advance for helping other families during their time of need. Each month laughter and chatter can be heard filling the hallways at Mary D. Lang Kindergarten Center. 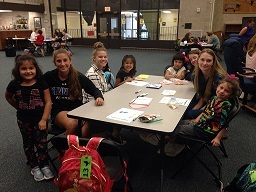 An after school program called Big Sister/Little Sister gives kindergarten girls an opportunity to meet and connect with a student from Kennett High School. The program has proven to be successful as each year the interest is outstanding. The program is at full capacity and the girls could not be more excited. High school students and students from MDLKC pose for a picture at Big Sisiter/Little Sister. 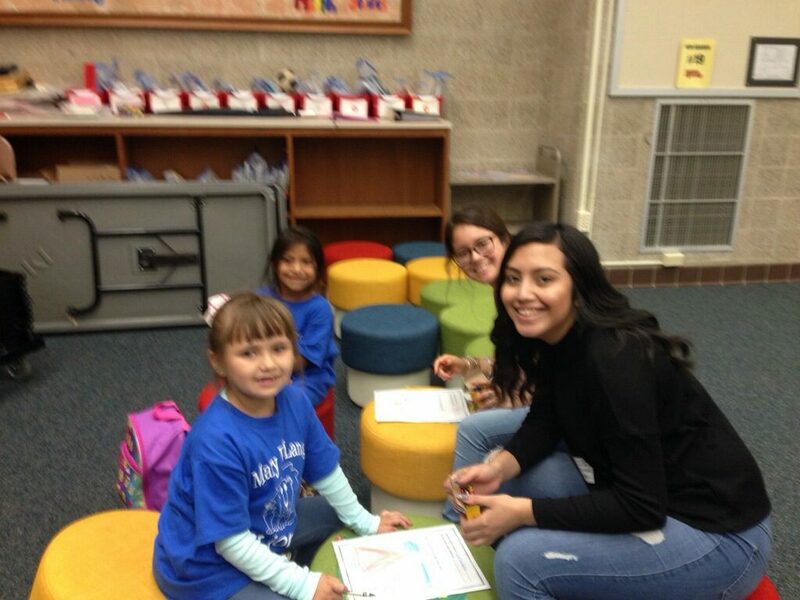 Kindergarten girls share activity time with their big sisters from Kennett High School. Family Reading Night is a Hit! 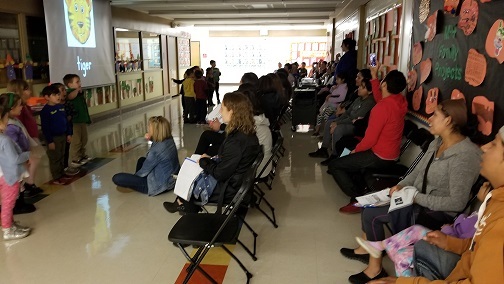 On Thursday, October 26, 2017, families filled Mary D. Lang Kindergarten Center for the annual “Family Reading Night.” Organized by Dr. Tricia O’Laughlin, this is the third year that the Mary D. Lang Kindergarten Center has played host to this thrilling evening. Throughout the night, family members get to see some of the activities that students use during their school day. There are three stations totaling about an hour of activity. At the three stations, families are shown ideas for helping with handwriting and introduced to our Handwriting Without Tears program; they are given the opportunity to log into Reading Eggs and Mathseeds with the assistance of teachers; and families are introduced to some of the phonics instruction students receive at school. 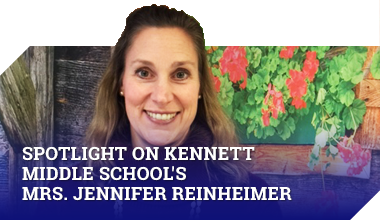 The program provides, not only an opportunity for families to see what the students are learning, but also time to ask questions of their child’s teachers. 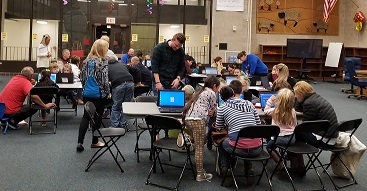 This family night provides a glimpse into those activities while promoting reading as a partnership between the school and the home. 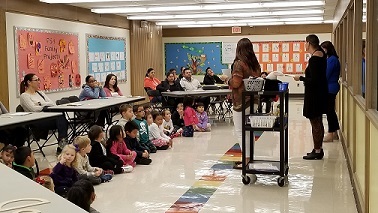 Parents learn our Letter/Sound Song at MDLKC Family Reading Night. Miss Daveler, Mrs. Lawson, and Mrs. Murphy help families log in to Reading Eggs and Mathseeds. Mrs. Marchini, Mrs. Ramagnano, and Miss Schwendeman show families how to help with handwriting. In early October, Kennett Fire Company visited Mary D. Lang Kindergarten Center for their annual Fire Prevention Program. 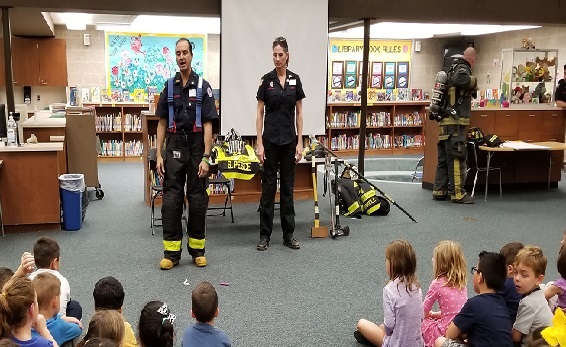 Students learned about fire equipment, fire fighting gear, and also what to do in case of a fire. Students were also treated to their very own Kennett Fire Company fire hats that the entire school wore to their buses. The information presented was extremely important, but also fun and engaging for the students. Everyone at the Mary D. Lang Kindergarten Center appreciates our emergency personnel from Kennett Fire Company No. 24 for making sure we all know what to do in case of emergency. 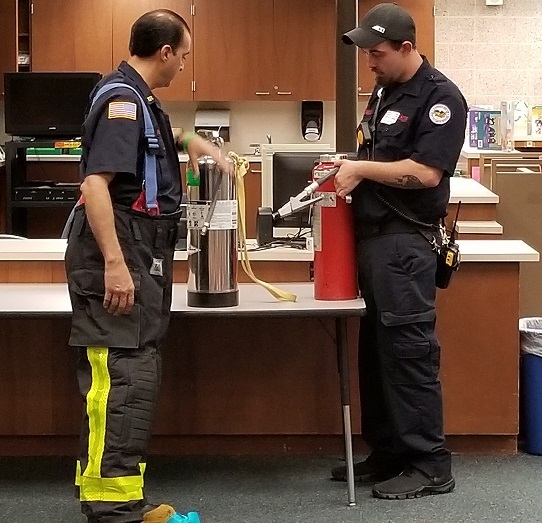 Fire Fighters show the students different types of fire extinguishers. Students listen as Fire Fighters explain to them how to stay safe. Fire Fighters explain the different parts of a fire fighting uniform and the tools fire fighters use. 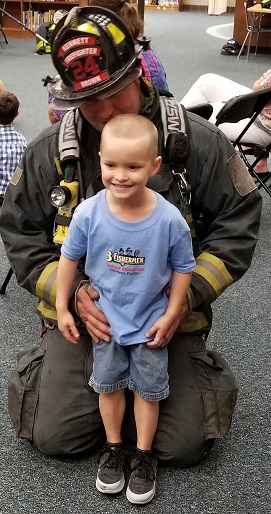 Fire prevention is super but even better when your dad walks in and surprises you! An Apple Picking We Will Go! Fall is for leaves changing colors, cooler temperatures (usually), pumpkins, and everything apple! 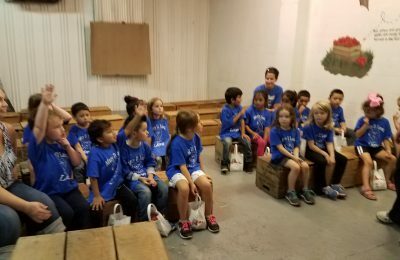 This month, Mary D. Lang Kindergarten Center students were treated to a delightfully delicious field trip to Highland Orchard to celebrate the start of school, their apple theme, and fall! 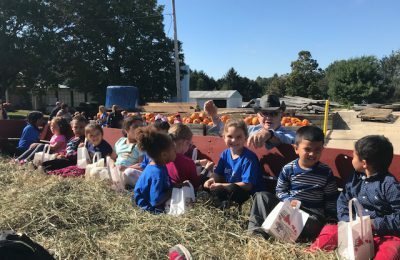 Each class went on a hayride to the apple field where the students exited the wagon and received a bag. 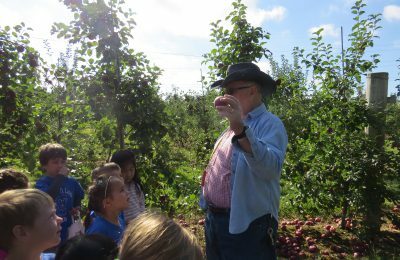 Guided by knowledgeable farmers, each student chose an apple from three different varieties available at Highland Orchard. 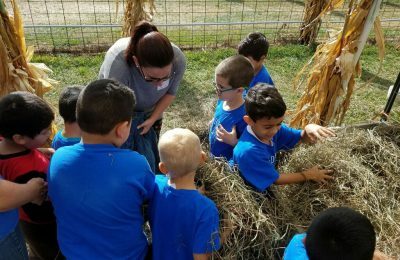 After the students filled their bags, they reloaded the wagon and made their way to the pumpkin patch. There, the farmers showed the students the life cycle of a pumpkin using tangible examples right from the field. 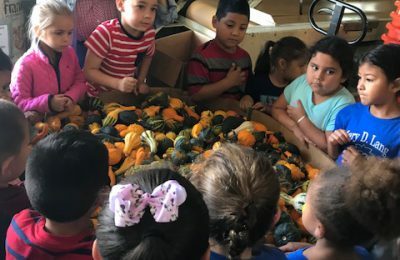 The farmer very carefully chose a pumpkin for the class as the students yelled out their wishes for the perfect pumpkin. The farmers shared that always have a good time choosing as the students guide them to their dream pumpkin. After the hayride came the most delicious and sweetly scented part of the trip. Students entered a classroom of benches and … there was an apple grinder! 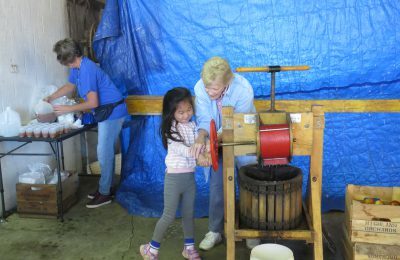 Each student got a turn to use the apple grinder as they assisted their farmer in the production of fresh apple cider. Everyone received a cup of cider and a fresh baked apple cider doughnut. As one can imagine, they do not last long. The scarecrow building was up next. It is usually the last leg of the trip. The students really enjoyed stuffing and fluffing their scarecrow to perfection. When it is completely assembled, the scarecrow joins the students and staff back to it’s new home at MDLKC. This trip is one of the best and the farmers are outstanding. Our students enjoyed the apples, the scarecrow, the sweet treats, and the ride. The hay ride begins at the orchard. Farmer Chuck talks to student in the U-Pod about varieties of apples. Another scarecrow comes to life for Kindergarten students! 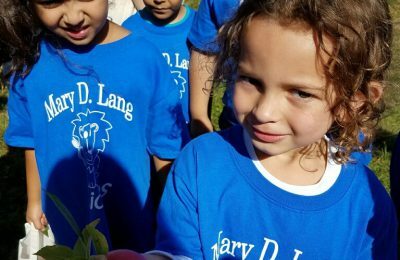 Students have an opportunity to make a scarecrow that they bring back to MDLKC. 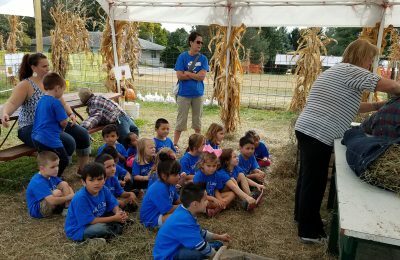 Students listen as the farmer explain how to make apple cider. Iris and Farmer Dotty help each other make apple cider. 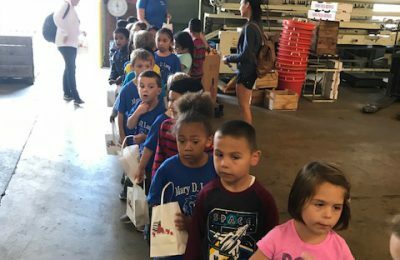 Students visit a GIANT refrigerator that holds all of the apples until they leave for the grocery store. Students choose a gourd to take home.